There is a pocket in Hawthorn near Glenferrie Station that is getting a huge amount of love in recent years. From the opening of the new Lido Cinema, to branches of Huxtaburger and Fonda, plus classic cafes like Crabapple Kitchen. We didn’t realise until one of the owners of Crabapple Kitchen walked by, that the new Venetian Italian joint next to Lido is a sister establishment. Vaporetto to the uninitiated is the most popular mode of Venetian transport along the Grand Canal. While this restaurant might take the name of those famous ferries, there is no doubt that restaurant goers in Melbourne’s East are going to think of this restaurant in year’s to come before their thoughts turn to holidays of the past. As you open up the drinks menu you see the usual salute to Harry’s Bar, one of the institutions in Venice, most notable for serving greats such as Hemingway, and for inventing the Bellini. That atmospheric buzz of a great venue translates here tonight, with a full house already and a bar that is heaving. By complete chance we are able to secure a bar table for two on the window after a short wait. Several others behind us are not so lucky. We were not really supposed to be having a big night out tonight. Having cooked several meals at home during the week we have been eventually worn down and came to this area to see what the menu looked like here, knowing we had plenty of other options if it didn’t grab us. 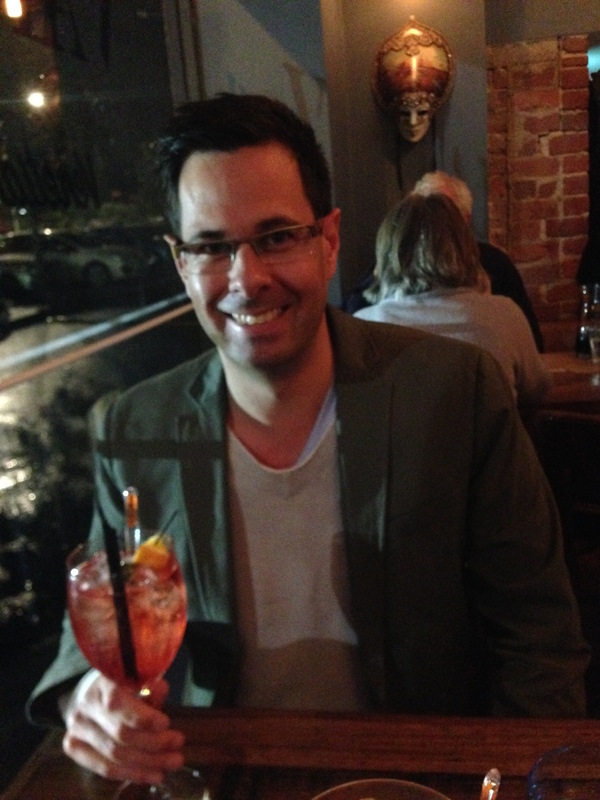 As we sip on our Aperol spritz we decide to have a main and dessert rather than try some of the starters or entrees, which are quite enticing. It’s a difficult choice but eventually Catherine decides on the gnocchi with rabbit ragu, and I choose the spaghetti vongole. Catherine’s gnocchi is the perfectly pillowy but firm, and the ragu is deep and rich as you expect, with the mushrooms adding to the flavour. The saltbush is not overpowering, adding a little texture, and the salted ewe’s cheese balances out some of the richness. It is a great dish and I go back across the table for several tastes. 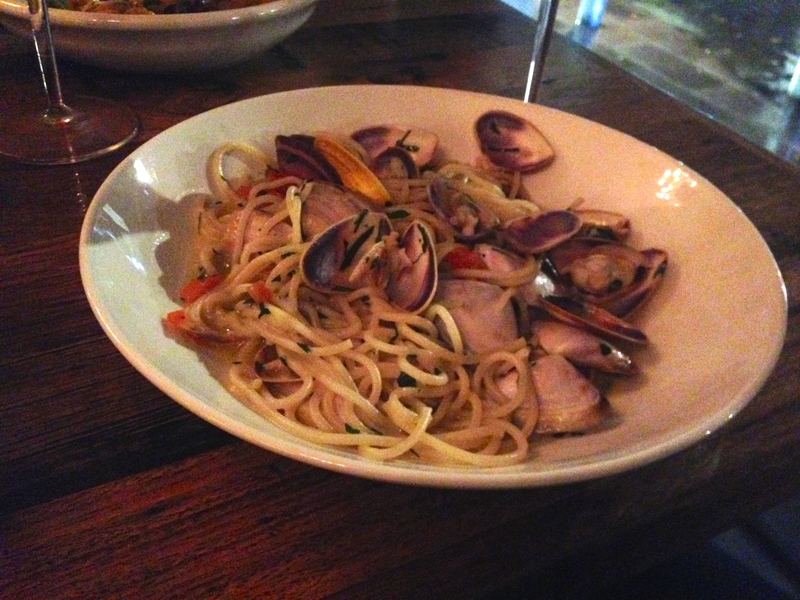 Not to say that my spaghetti vongole is not delightful. 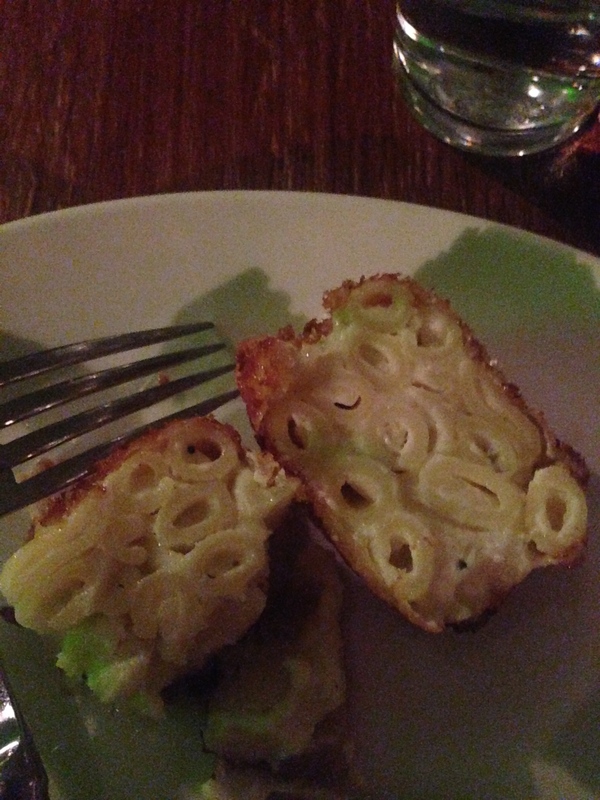 The house made pasta is properly al dente, sitting in a sauce restrained in quantity, but certainly not quality. The Italian white wine (Soave) that is the base of the sauce is one of my favourite varieties, and the cockles have good flavour. 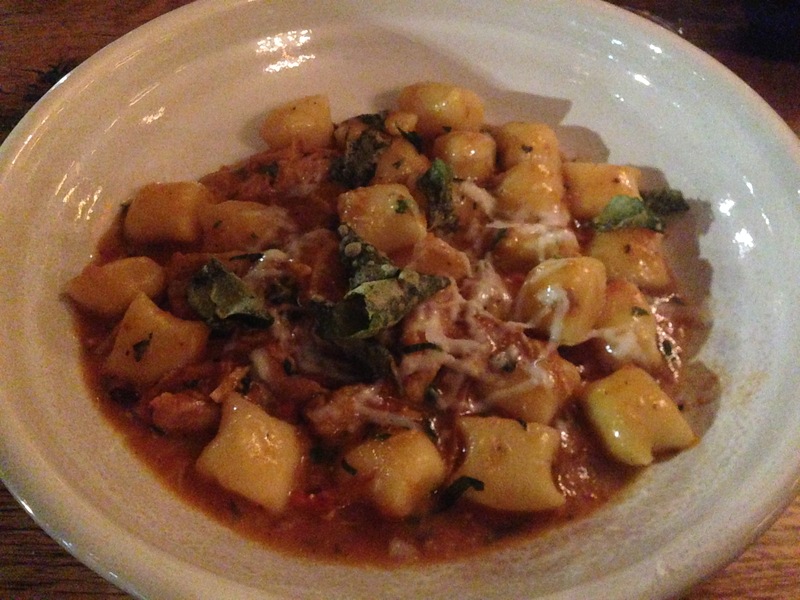 It is the closest feeling you can have to eating in Northern Italy without being there. There are only three desserts available, plus a cheese course, but we are completely torn and on the verge of ordering all three. We wait to make our decision while we finish our sangiovese that comes from a tap. It is a novel concept but next time I will probably order something from the bottle. If we weren’t driving, $26 for a carafe would have been a good deal though. The two main waitpersons we’ve had serving have both been fantastic. One of them appears to be one of the managers, but the other is equally experienced. They are the epitome of attentive, seemingly there every time we need something, but never hovering. In fact, they are run off their feet. We take a rain check on the tiramisu and order the doughnuts, and the roasted quince dish (mainly for the fig and mascarpone ice cream). The presentation of the latter is fine dining quality, and the taste amazingly matches. 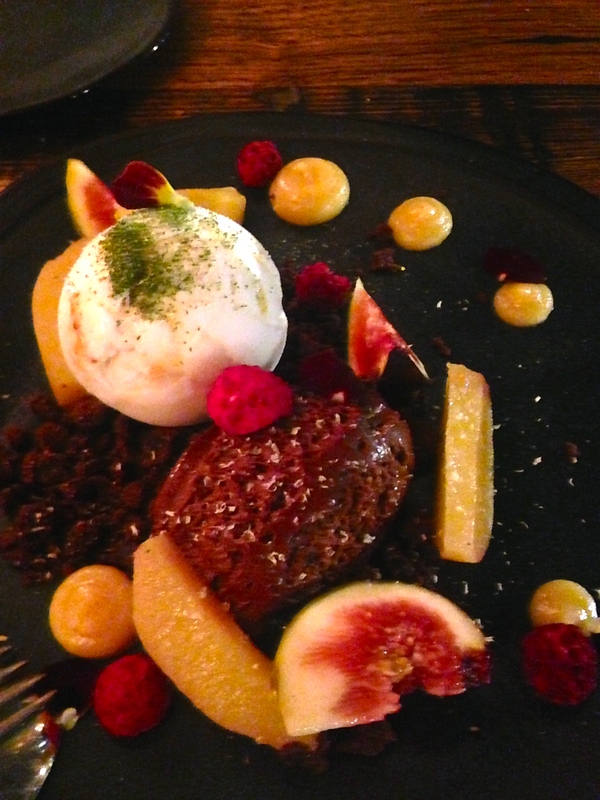 The quince is perfectly roasted along with fresh figs, the chocolate is rich and soft, and the ice cream is absolutely delicious. Extra texture comes from the chunky chocolate soil, that tastes like a brownie. It is a classic combination served with flair and instantly on the list to go back for. 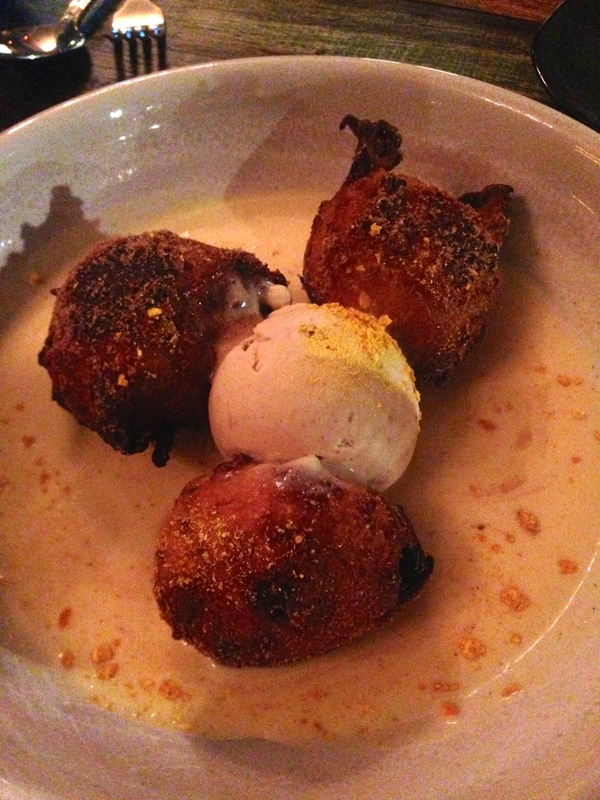 The doughnuts are rave-worthy too, but we are still mesmerised by the quince dish. Sitting in a shallow pool of sweet vanilla custard, the doughnuts taste full of cinnamon and orange zest, with that flavour from rose water that we love (but some don’t!) The hazelnut gelati is the primary reason this dish jumped out and it is terrific too. Vaporetto is a revelation. Looking out to a carpark bordered by the swimming pool, Coles and Glenferrie Oval, you would not expect to feel like you are in the back streets of Venice (especially given the lack of cars) but somehow the team here provide that exceptional type of experience. 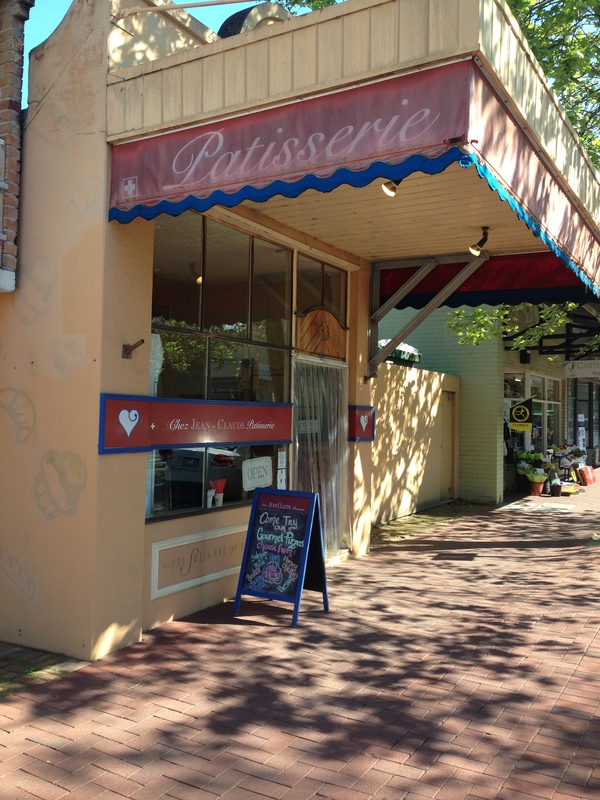 Jean Claude Patisserie – Subiaco –Numerous Occasions – Weekdays Only! Thinking of Jean Claude Patisserie brings a smile to my face. It is hard to remember a better patisserie in Perth before it opened, and all patisseries since hope to match the popularity (and quality) that has been present at Jean Claude for decades. Sure, I feel a little aged writing this, but it is incredible the baguettes now are exactly the same as they were back then! It leaves you in awe thinking about how maybe in another 50 years I’ll be still coming here for the same smoked salmon, cream cheese and capers baguette that I did 68 years prior! The crunch of the outside revealing the soft bread and divine smoked salmon filling. The doughnuts are first class. In this age of the doughnut, it has not changed, and doesn’t need to. The breads are first rate; the pies and sausage rolls are special. My main memory though is some of the technically challenging sweet pastries and tarts which are some of the most delicious I’ve had in Perth, and much further abroad. 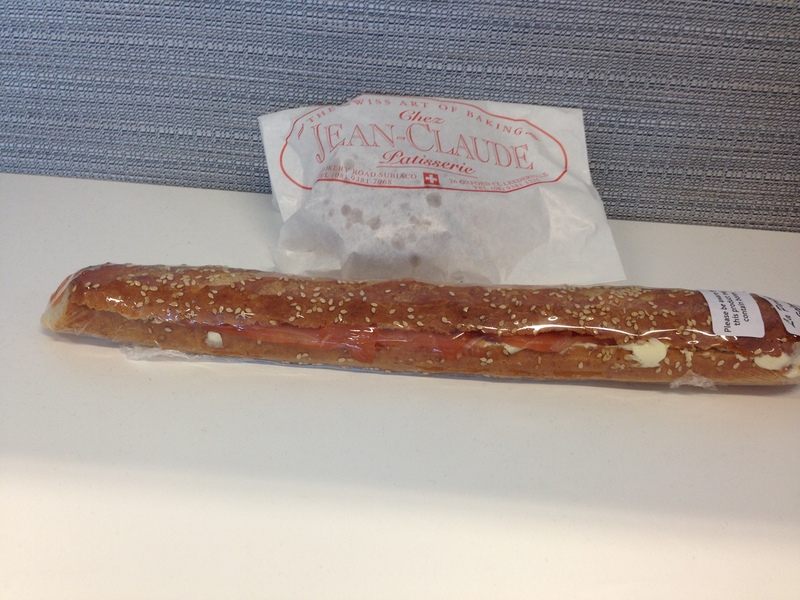 I had my first strawberry flan at Jean Claude, and still think of the Jean Claude touch when I eat them anywhere. The almond, and the chocolate, croissants are heavenly. There are times where in the search for the next big thing we get bored of the last big thing. Jean Claude produces patisserie fare that is an outstanding exception, and impossible to see being passé at any time. “Break-ups are never easy” is a line used so often for such an obvious observation. But what about restaurant favourites. 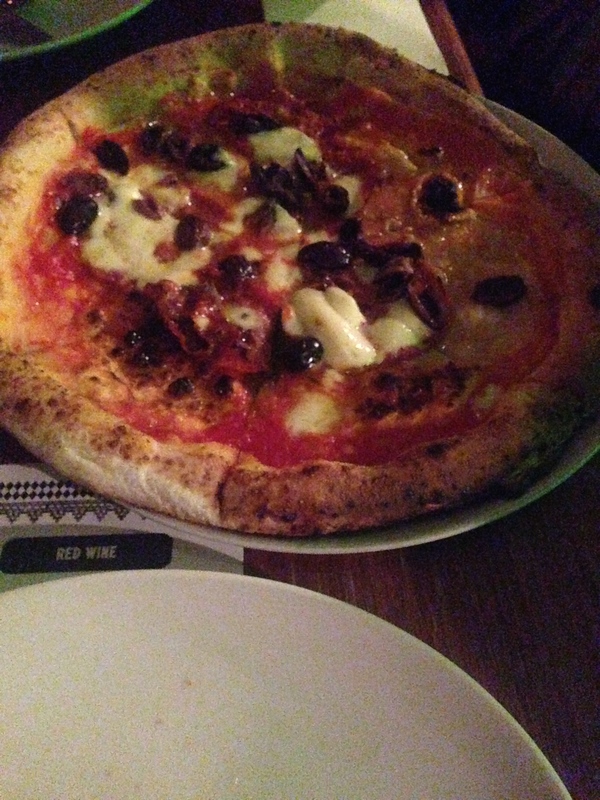 I am seriously considering taking Ace Pizza out of my favourites on Urbanspoon. Sure, I definitely like you, but I just don’t feel the same spark. You let me down bad last time, and I’m not sure the fire in your pizza oven burns as brightly for me anymore. I am not the world’s biggest restaurant critic. I don’t want to be. I like food too much to want to find faults that are not already obvious. But burnt and at the same time soggy pizza? Please. We had to tell our waitperson. And they didn’t really comprehend but we told them we’d prefer another one please. 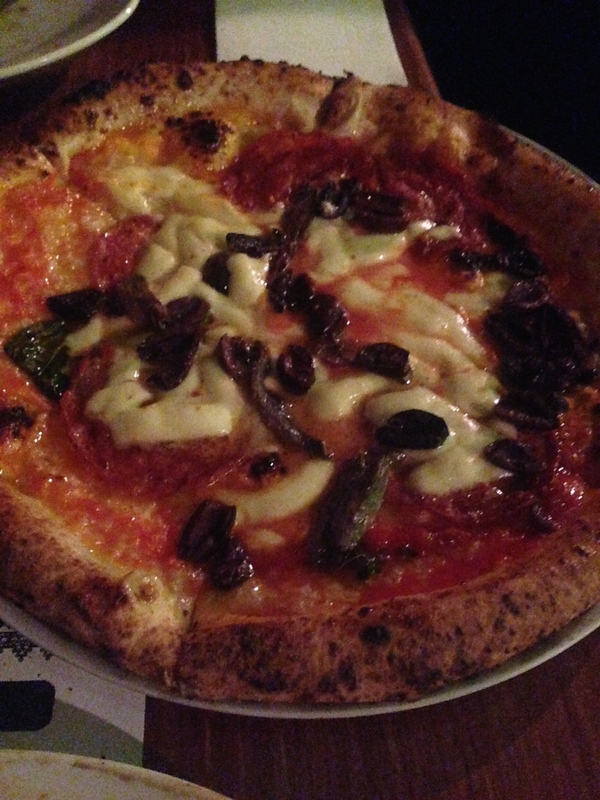 I saw her conversation – firstly with the humble pizza chef, then the chef de partie, then the head chef. I was too far away but I don’t know if they saw a huge issue because the waitperson never came back to explain. Put it another way. It was so burnt that the burnt base had come though to the, hardly covered in anything, top of the pizza (the black on the right of the pizza in “take one” is not olives). The next attempt was better but the oven is overcooking without crisping up the pizza and the result is nice ingredients being left on a dark and dirty, soggy base. I’m sorry, but it’s over. And I loved you so much a few months ago. The save is the before and after. 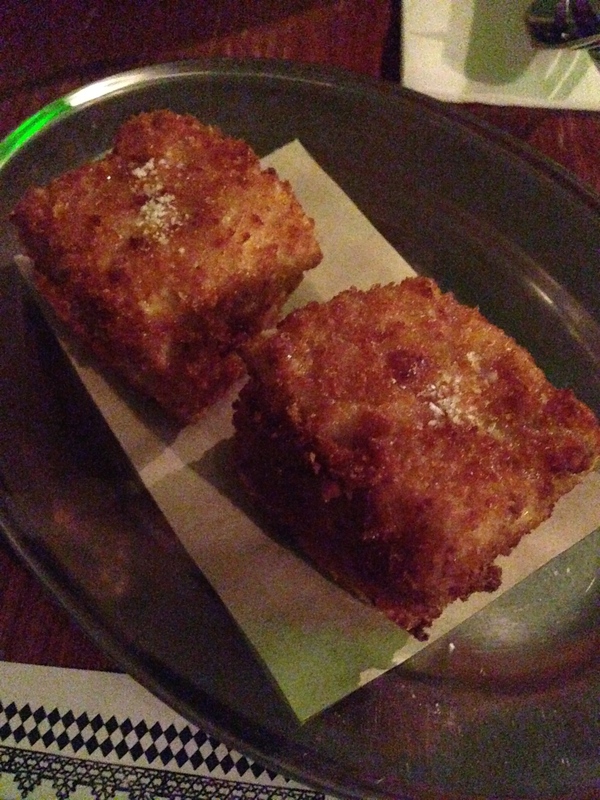 Before we had the fried macaroni and cheese and it is decadent genius. After we had the creme brûlée doughnut and that is just crazy good. 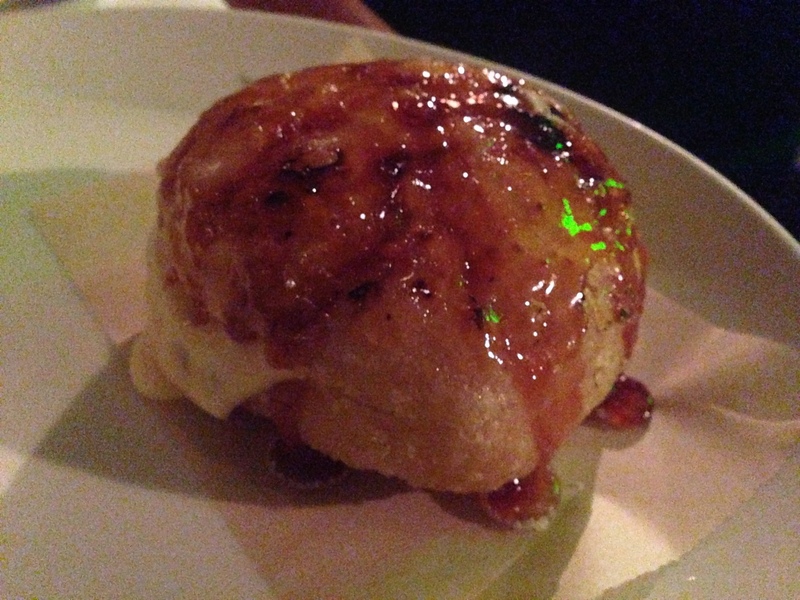 A doughnut filled with creme brûlée and covered in toffee. The only thing that could possibly go wrong is medical in nature and we can’t talk about food in those terms if we are enjoying it. It’s not like the service here is bad. It is actually pretty good. But come and say we are sorry the chefs burnt your pizza rather than “was that one okay?” It’s not like I want it for free or we ate half of it to begin with. Ace Pizza is no longer a favourite but I would never discourage anyone from trying it. I like the vibe, the staff, and most of the food, not to mention the drink selection. But it is a pizza place and that aspect has to be perfect every time.